If you've been injured due to a healthcare provider's negligence, you may encounter a number of unfamiliar terms as you investigate your legal options. Although you can always ask your attorney for clarification, this glossary of malpractice terms provides a good starting point for better understanding how your case will proceed. Arbitration: Deciding a medical malpractice claim or other legal dispute without having to go to court is known as arbitration. Breach of duty: Breach of duty means that the defendant's actions were outside the accepted standard of care for your condition. Breach of duty can be by accident or the result of a deliberate mistake, but this does not affect the outcome of your case. Causation: To prove causation, you must show your damages could only have been caused by the malpractice action and are not the result of an unavoidable complication or medical issue outside the healthcare provider's control. Contingency fee: A payment arrangement in which the plaintiff does not pay upfront for legal representation is known as a contingency fee. In this agreement, the person who was injured agrees to provide the attorney with a percentage of the final settlement as a fee for service. 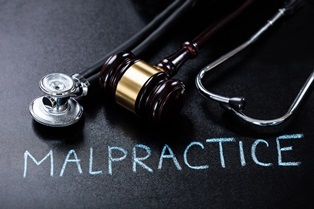 Malpractice claims are typically accepted on a contingency fee basis. Damages: In a malpractice claim, damages are the financial losses you've suffered such as medical expenses and lost wages. Duty: Duty means that the defendant, whether it’s your doctor, nurse, dentist, chiropractor, or other healthcare provider, was caring for you in a professional capacity. Failure to diagnose: Failing to conduct a complete medical examination and order appropriate diagnostic tests when a patient complains of specific symptoms can be a form of malpractice when the patient does in fact have a condition requiring treatment. Informed consent: Before a procedure is performed, a doctor must explain to the patient the potential risks and benefits as well as the effectiveness of the procedure in relation to other accepted treatments. After receiving this information, the patient must sign a document consenting to the procedure. Failing to obtain informed consent is a form of malpractice, unless the patient is unable to provide consent due to an impairment or emergency situation. Medication error: Giving a patient too much of a medication, too little medication, or the wrong medication can be forms of malpractice when the mistake results in side effects or a worsening of the patient's condition. Misdiagnosis: Misdiagnosis refers to diagnosing a condition as a less serious problem such as mistaking a patient's heart attack for heartburn or misdiagnosing cancer as fibromyalgia. This is a form of malpractice when the delay in obtaining the right diagnosis limits treatment options or causes additional harm. Never event: In the medical field, never events are those which should never happen under any circumstances because they represent clear negligence. Examples of common never events that are the basis of malpractice claims include surgical equipment left inside the patient and performing surgery on the wrong body part or wrong patient. Patient abandonment: Refusing to treat a patient without a valid reason or without giving the patient time to find a suitable care provider is referred to as patient abandonment. This is a form of malpractice when the delay in finding suitable care causes harm. Standard of care: The standard of care is a term referring to the degree of skill and care a typical qualified healthcare provider would demonstrate when treating a patient for similar symptoms and under similar circumstances. Statute of limitations: Louisiana has a one-year statute of limitations for malpractice claims, with very few exemptions. You must file your claim within this timeframe to receive compensation. Wrongful death: A wrongful death occurs due to malice, negligence, or recklessness. When a malpractice case involves a wrongful death, the next of kin are the ones who receive the settlement. Typically, this is either the spouse, child, or parent. Malpractice law can be quite complex, so working with an experienced attorney is the best way to protect your right to a fair settlement. Your attorney can document your damages, locate expert witnesses, and negotiate with the insurance company on your behalf. Contact us online or call our office directly at 318.588.6303 to schedule a free, no-obligation consultation with Neblett, Beard & Arsenault’s dedicated legal team.